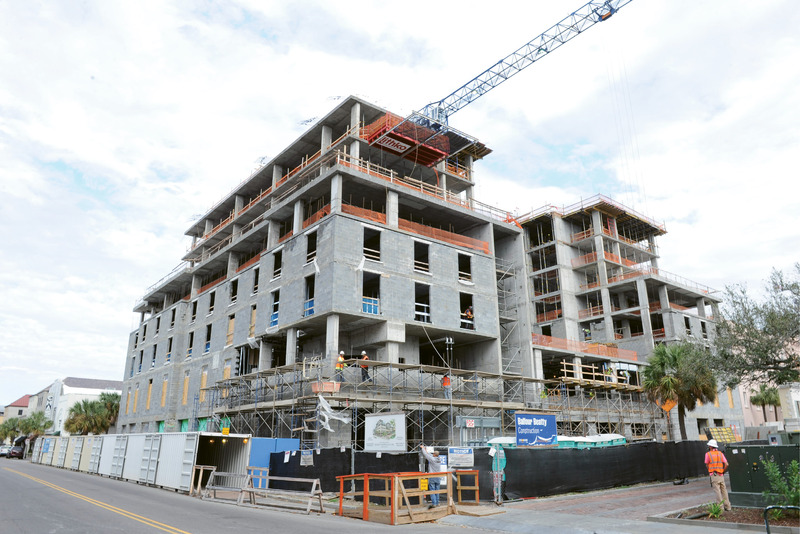 With five hotels under construction and 11 more approved and in the pipeline to add to the current inventory of nearly 4,500 rooms, can Charleston handle more tourism or will downtown livability need its own “Vacancy” sign? 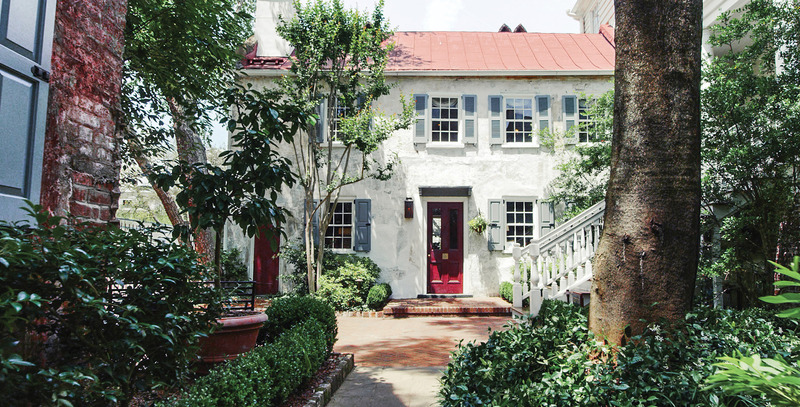 Last fall, this circa-1840 house on Woolfe Street was readied to move several blocks east of Meeting Street to make way for a new apartment complex and a 162-room hotel. A local contractor will restore the structure on Amherst Street. 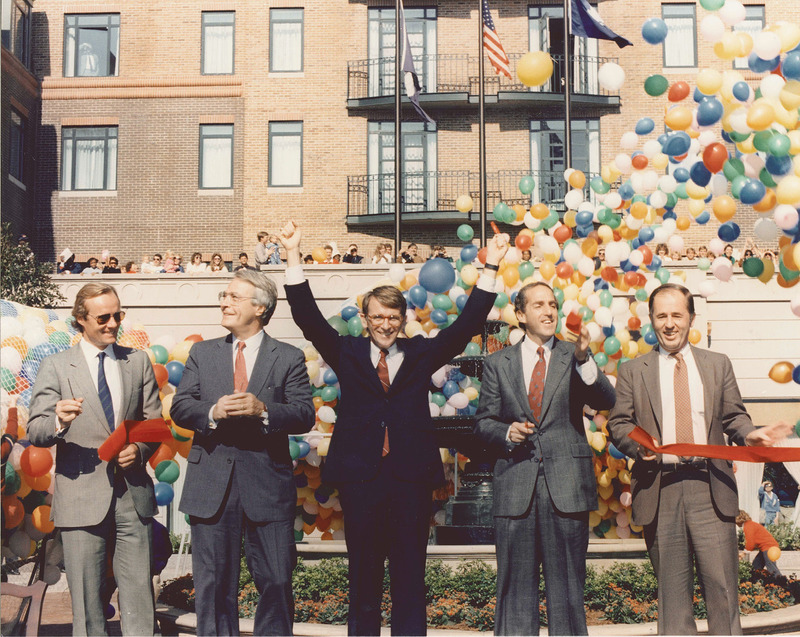 Then-Mayor Joseph Riley Jr. (left center) celebrates the opening of Charleston Place on September 2, 1986. 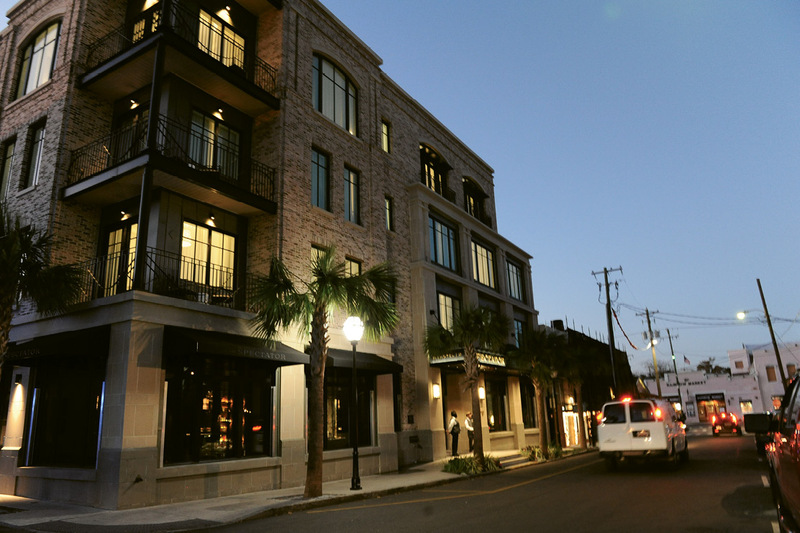 Charleston Place was built on a once-derelict block in the center of the peninsula. 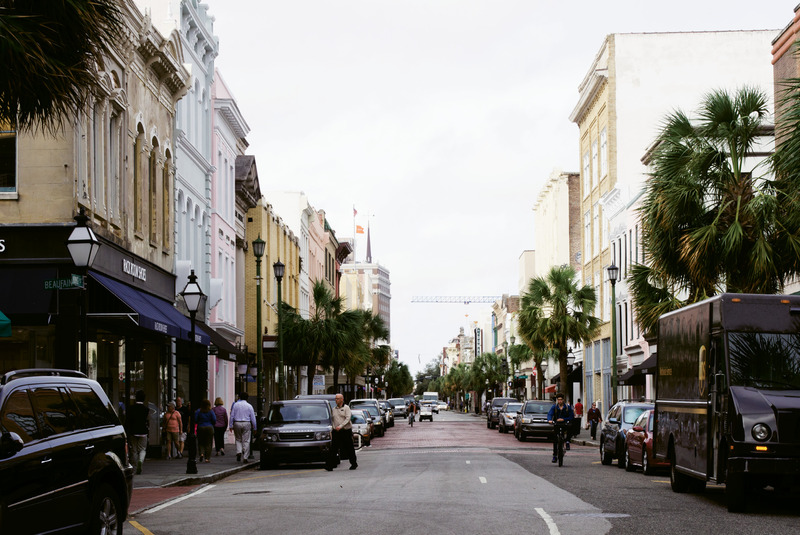 Called “Riley’s Folly” in the ’80s, the project is largely credited with resurrecting the city and putting Charleston on the map. 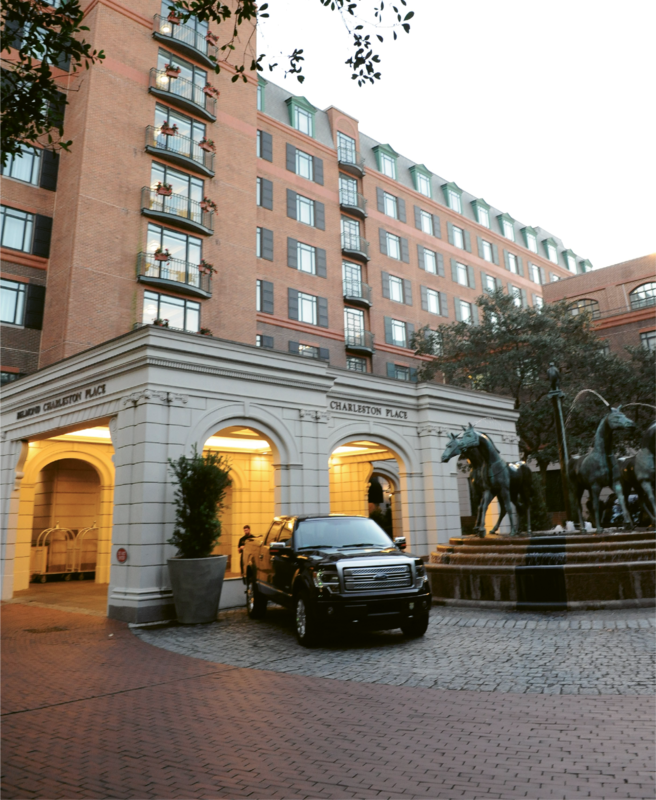 Charleston Place, now under the global Belmond brand, celebrated its 30th anniversary last year, completing renovations on all of its guest rooms as well as the Thoroughbred Club and adding more amenities, such as the new pub, Meeting at Market. 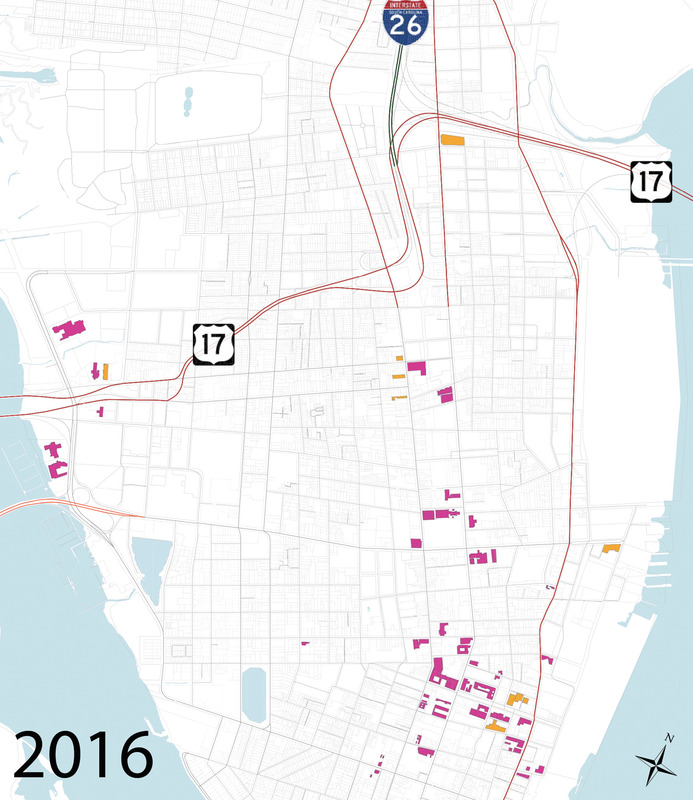 This map from the Peninsula Hotel Study, prepared by the City of Charleston’s department of Planning, Preservation, and Sustainability and division of Business and Neighborhood Services in June 2016, shows all existing hotels and those under construction in magenta and 11 recently approved in orange. Upon completion, the peninsula will have nearly 6,000 guest accommodations. To read the full report, visit www.charleston-sc.gov/DocumentCenter/View/11618. 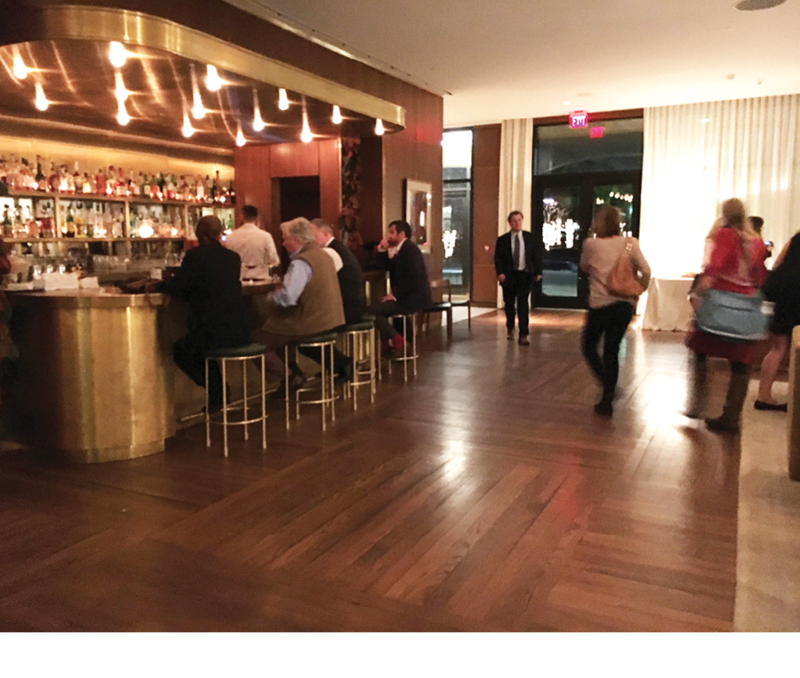 Dean Porter Andrews, a hospitality industry veteran and CEO of Easton Porter Group, believes the city should establish quality guidelines for new peninsula hotels to address downtown livability issues and achieve optimal economic benefit. 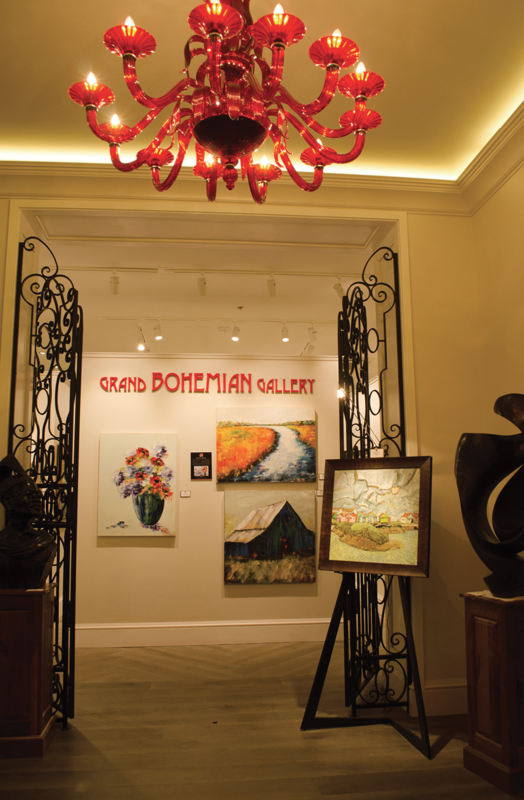 The gallery at Grand Bohemian on Wentworth are among the hotel’s amenities that locals can enjoy, too. 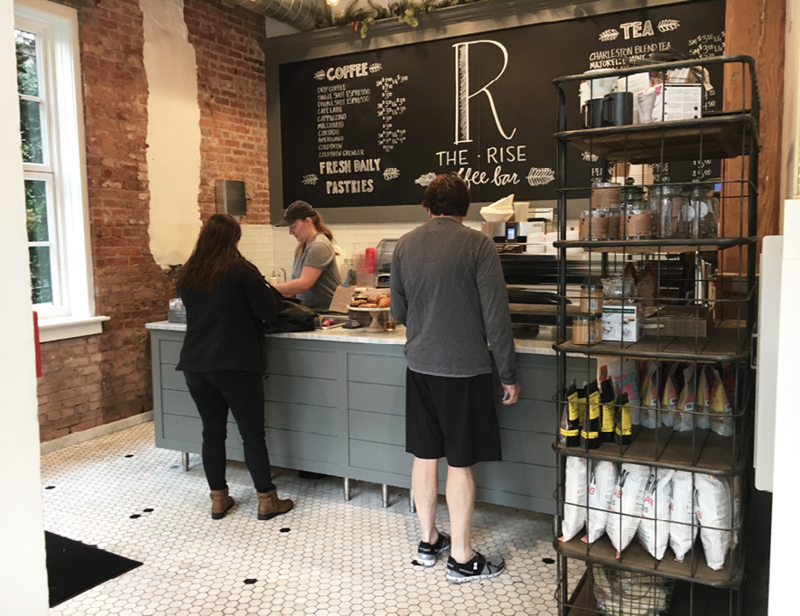 Public spaces at The Restoration include The Rise coffee shop, as well as a courtyard, a gallery, rooftop restaurant and bar The Watch, and a spa. 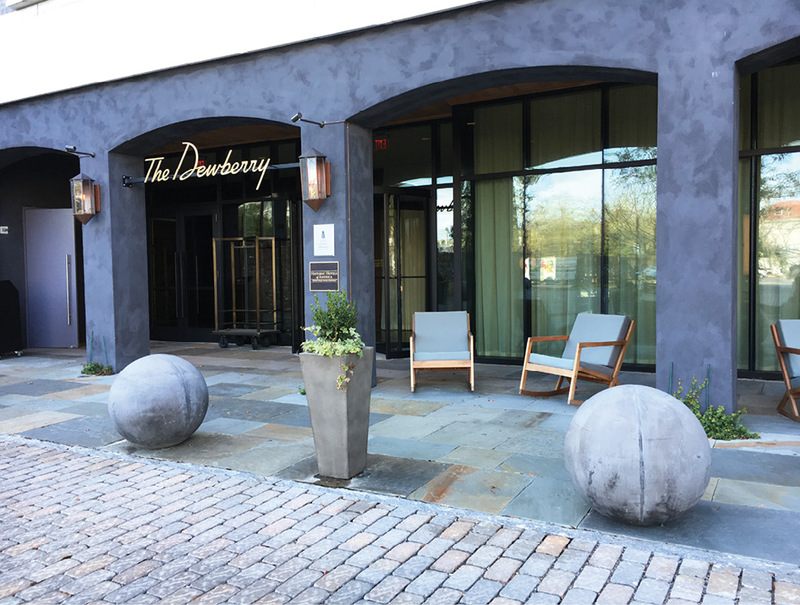 The Dewberry offers up inviting outdoor seating areas. For a few years, construction cranes have dominated the downtown skyline. At right is the Courtyards at 411 Meeting Street complex, under-market rental apartments that are slated to become a 300-room hotel. 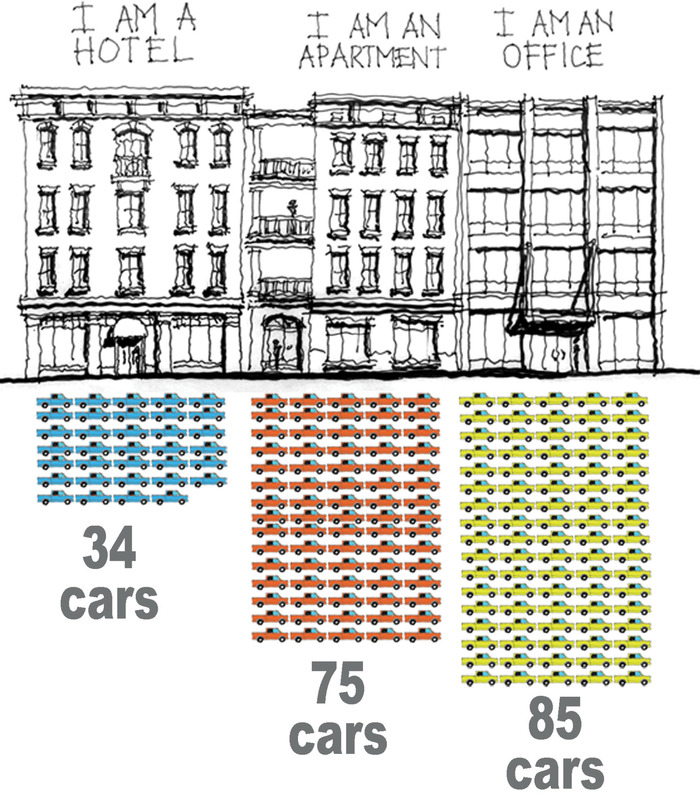 In a post for buildingsarecool.com, local architect Stephen Ramos calculated required parking for buildings of the same size but different uses, based on City of Charleston ratios, and determined that hotels contribute the least to traffic congestion. 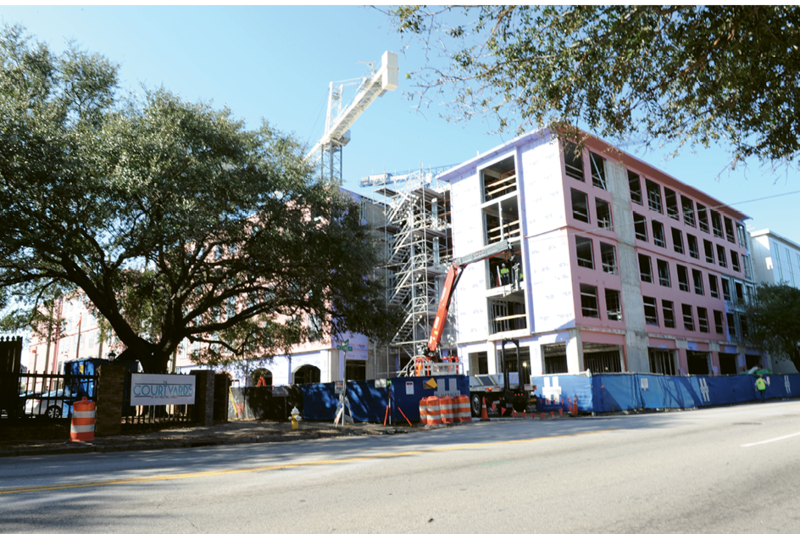 Hotel Bennett, locally owned by Bennett Hospitality and operated by Salamander Hotels, will open in fall 2017 adjacent to Marion Square. The luxury property will offer 179 guest quarters, two restaurants, three bars, a spa, a ballroom, and meeting spaces. 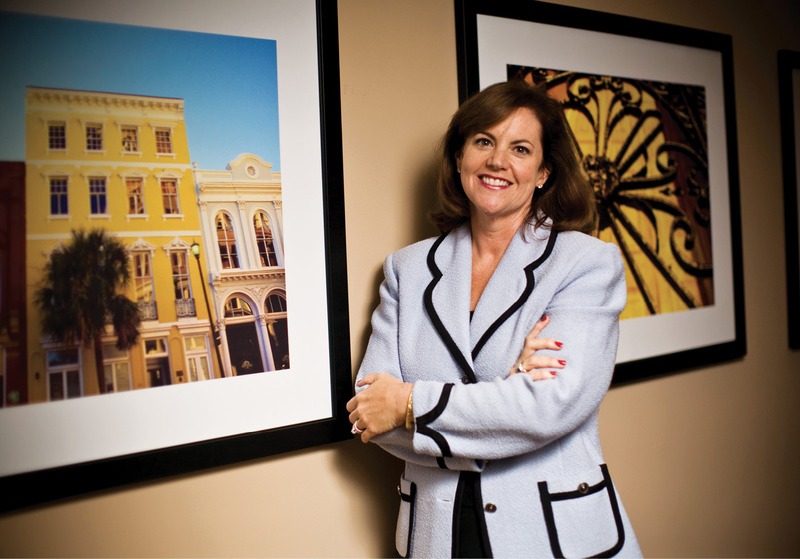 Charleston Area Convention and Visitors Bureau CEO Helen Hill says the key to balancing tourism and livability issues is the right mix of hotel types across municipal lines. 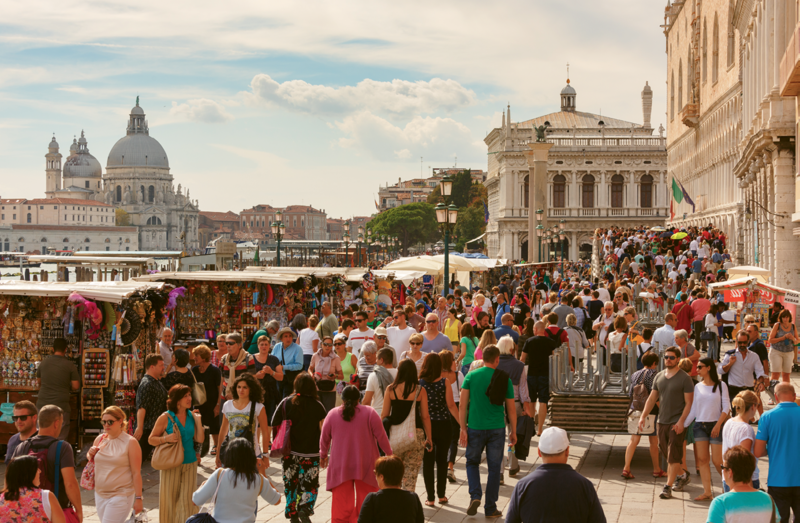 Last fall, The Post and Courier ran an op-ed by art historian and If Venice Dies author Salvatore Settis, who warns of unchecked tourism killing an historic city, such as Venice (shown here). “The city has a long history of highly regulating tourism. We don’t want to throw the gates wide open, but our goal is to balance the tourist experience with the quality of the resident experience,” says Jacob Lindsey, director of the city’s department of Planning, Preservation, and Sustainability, which aims to achieve a balance of building uses and promote walkability to minimize traffic. 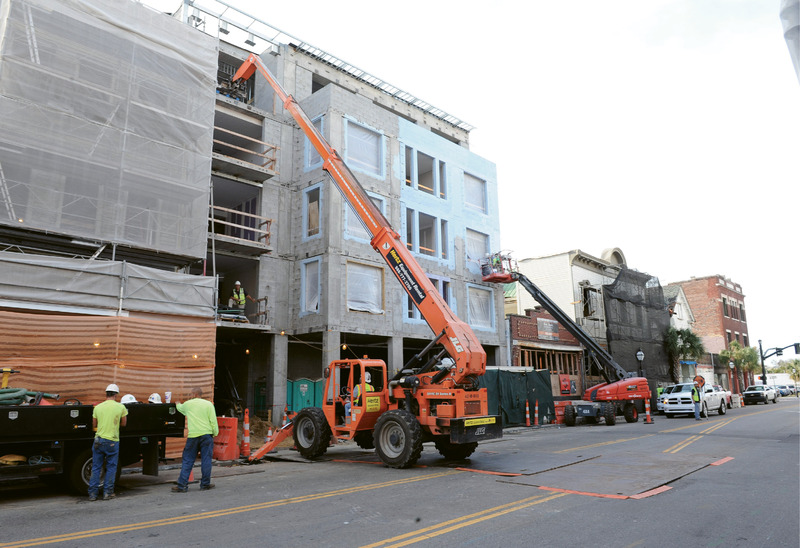 A 54-room hotel goes up on a former vacant lot on upper King, across the street from the Hyatt House/Hyatt Place properties, which opened in September 2015 with a combined 304 rooms, meeting spaces, and a parking garage. Easton Porter Group CEO Dean Andrews believes the growth in hotel development and the cruise industry raise similar questions about quality of life versus tourism. Achieving a beneficial balance results from prioritizing quality over quantity, he suggests. Fast-forward to the first months and first year of Mayor John Tecklenburg’s term, and the contrast is as striking as orange nylon bedspreads at the Motel 6 versus 400-count Irish cotton duvets at The Dewberry: Riley stuck his neck out and expended political capital he didn’t yet have to cobble together deals to open 442 new hotel rooms, while Mayor Tecklenburg campaigned on a pledge to halt hotel development, at least temporarily. In his “Our Quality of Life First” plan, Tecklenburg proposed “…a hotel approval pause while we work collaboratively with citizens, businesses, and neighborhood and preservation groups to create sensible new limits on hotel development in the city.” When brought before City Council in February 2016, the mayor’s proposal was resoundingly shot down in a 10-to-one vote, the lone affirmative vote being his. 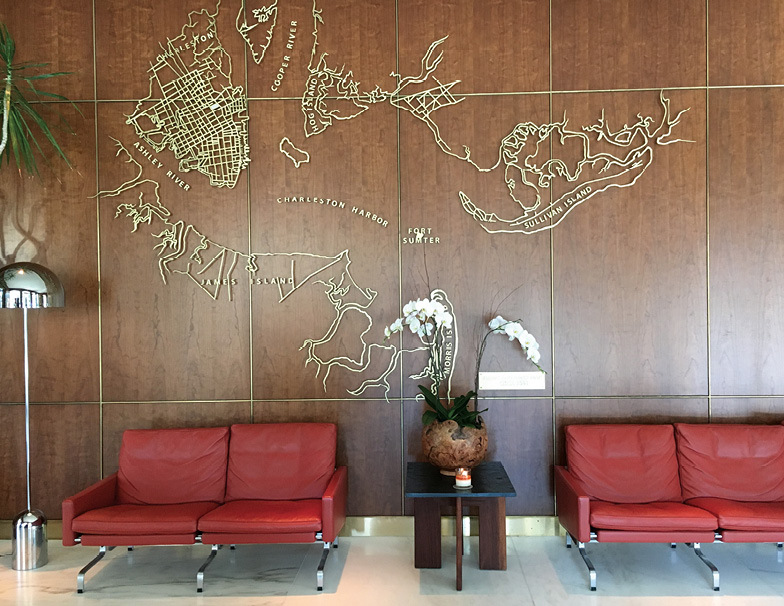 Granted, the dynamic has shifted in the three decades since Charleston Place (now part of the premier global Belmond brand) opened in the fall of 1986. 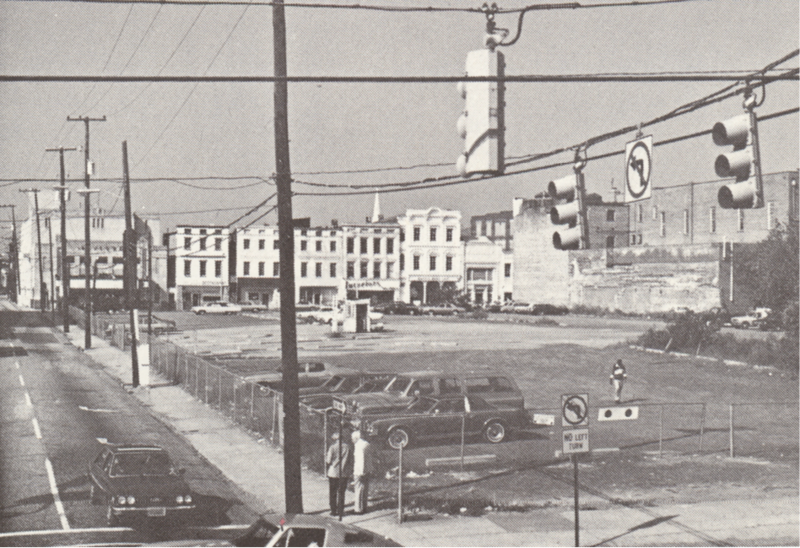 Back then, downtown Charleston was suffocating as suburban shopping malls in West Ashley and North Charleston siphoned off retail and commercial investment. Today, however, Citadel Mall is a more like a defunct fortress of “Available” signs, while downtown Charleston is beyond bustling. Whether or not we officially hit “pause” on hotel development, many feel it’s imperative to consider bigger questions. With nearly 4,500 hotels rooms available on the peninsula, another 461 currently under construction, and 11 more hotel properties approved and in the planning pipeline, questions of quality of life versus tourism, similar to the cruise-ship issue, come to the front desk. 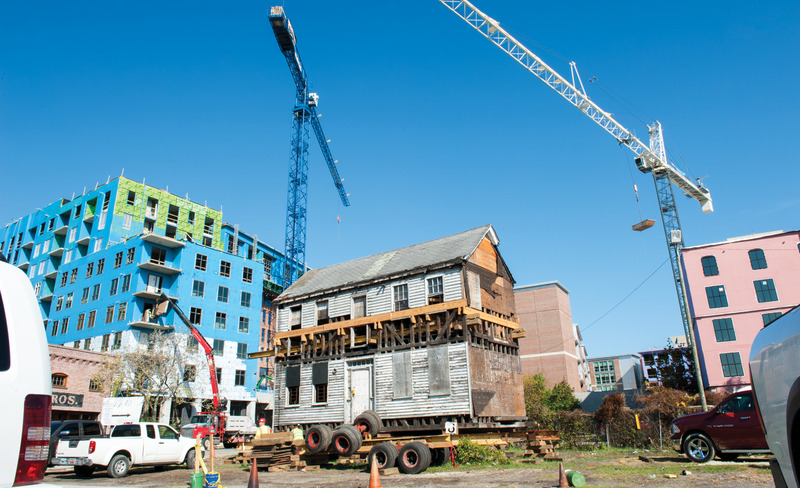 The question may be less “Is there room in the inn?” and more “How much is too much?” At what point is the balance so unbalanced that Charleston’s historic character and residential charm needs its own “Vacancy” sign? Riley’s “folly” paid off in spades, and tourists. And it definitely benefitted business development, with an uptick in downtown commercial real-estate prices that is still steadily, or rather steeply, rising—perhaps to a dizzying level, at least to some. Frank Norvell, a commercial broker with Norvell Real Estate Group, has witnessed both the payoff, and price, of Riley’s successful gamble. 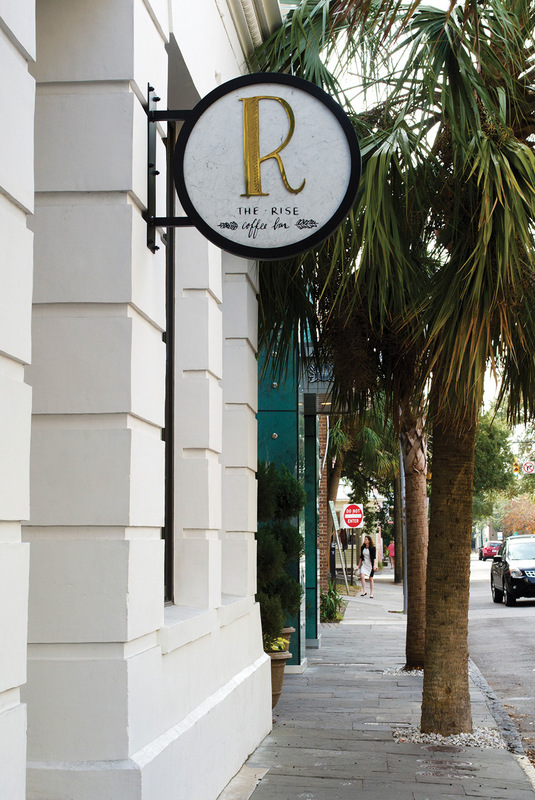 In 1996, Norvell, who then worked with The Beach Company, was a key player in bringing marquee retailer Saks Fifth Avenue to King Street, a coup he attributes directly to Charleston Place putting the peninsula “on the map.” Other businesses and retailers followed suit, with banks shifting their headquarters to Meeting Street rather than Broad, and national retailers setting up shop along King Street. Today, Norvell sees that trend among his corporate clients reversing. 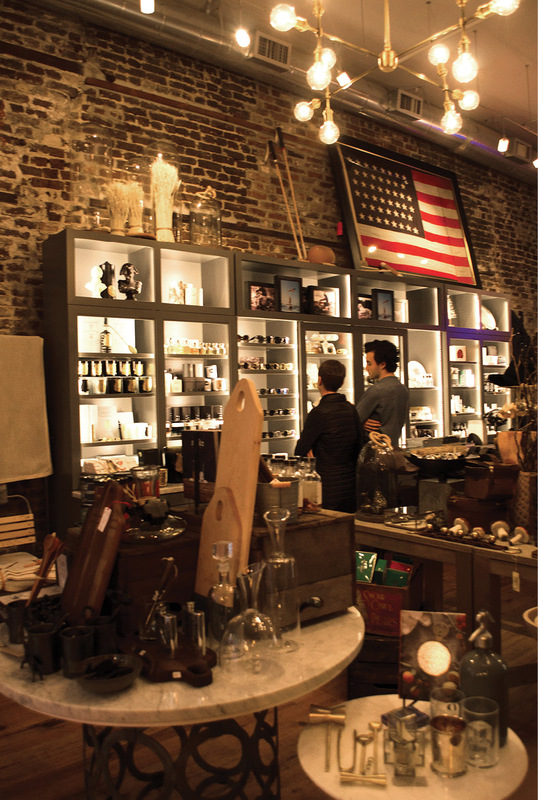 “Charleston is on a roll. You pick up any magazine, and we’re number one in something, but when investors and businesses call us and want in, then hear what the real-estate prices are, they shake their heads,” he says. And many of his existing clients are frustrated by the increasing downtown traffic congestion. “Their clients and customers can’t get to them. They’re telling me that when their lease is up, they want out of the fray, and they’ll only consider locations north of Calhoun,” Norvell explains. 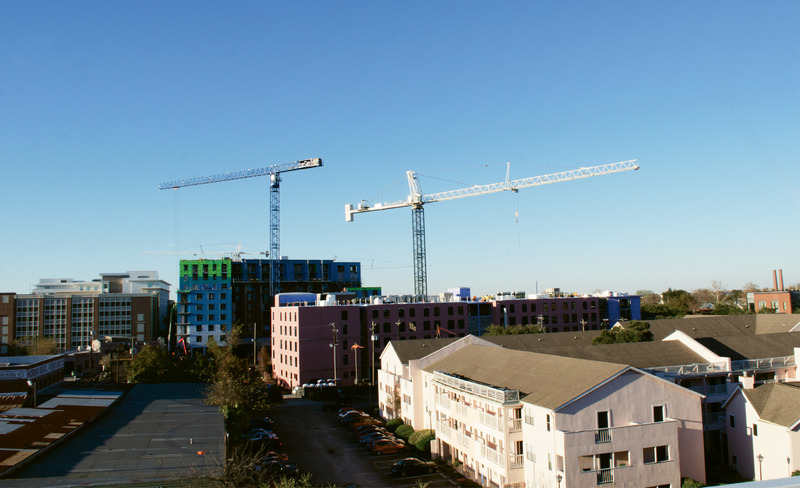 The onslaught of new construction and development on the peninsula—commercial; multifamily residential; retail; and, yes, hotel—since recovery from the recession started to kick in around 2010 is undeniable. Certainly not all of the construction has been hospitality-related, but the industry accounts for a chunk of it. In the last few years, the arrival of high-profile new hotels, including The Restoration (75 Wentworth), The Spectator (67 State), Grand Bohemian (55 Wentworth), and The Dewberry (334 Meeting) have garnered national and international attention and accolades from the likes of The New York Times and Travel + Leisure, which named The Spectator Hotel the “No. 1 Hotel in the World in 2016.” If all projects that have received Board of Zoning Authority approval move forward, another 1,031 rooms could be added to the peninsula’s current inventory of 4,400-plus by 2019. And these numbers aren’t counting the rampant hotel growth in the surrounding areas: the newly remodeled Marriott North Charleston opened in October, joining a dozen or so other hotels already nestled around the airport and another half-dozen underway in the vicinity. 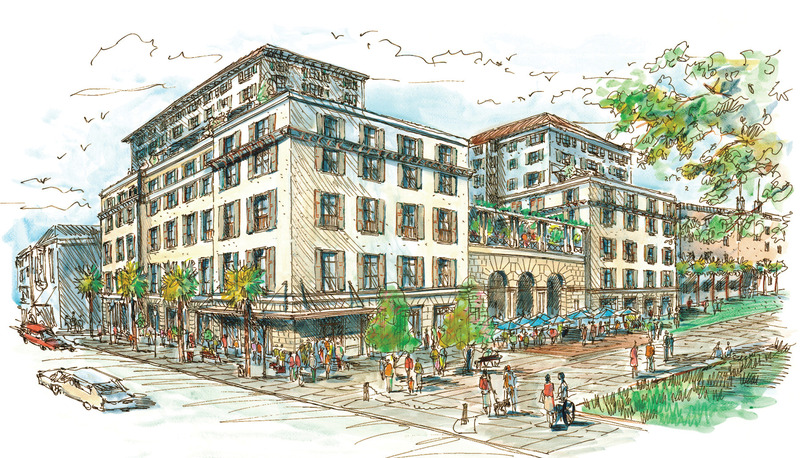 According to projections in the City of Charleston’s 2016 Peninsula Hotel Study, North Charleston is on track to add 564 rooms in five new hotels; Mount Pleasant will make beds in 1,441 guest quarters in eight new hotels, and West Ashley will add 370 rooms in three new hotels. That’s a lot of mini shampoo bottles. Is this growth sustainable and economically viable? Evidently so. Nationally, the U.S. hotel industry outlook is mixed, with experts predicting occupancy rates to remain flat relative to 2015 numbers. However, the key demand drivers are actually city specific, says industry veteran Dean Porter Andrews, who was at the helm of Charleston Place when it opened and then served as global VP for Orient Express for years. 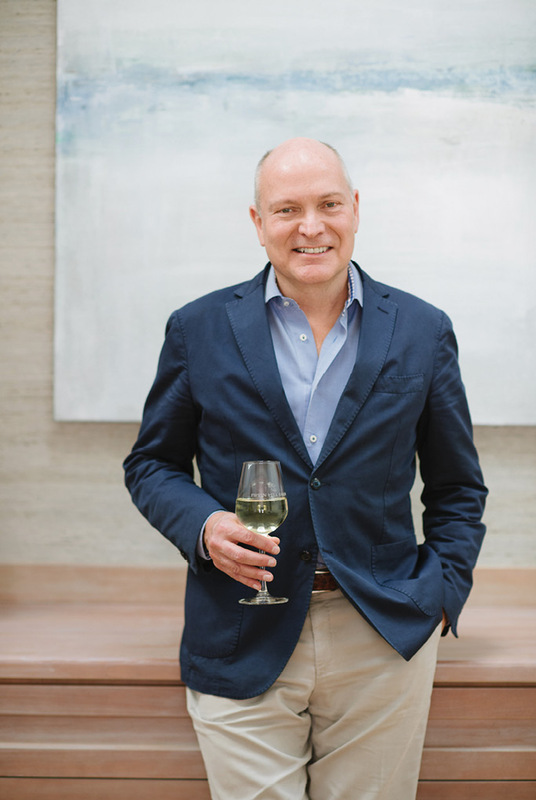 Today, Andrews is CEO of Easton Porter Group, a luxury hospitality enterprise whose portfolio locally includes the Zero George Street boutique hotel, Zero Restaurant + Bar, and Cannon Green restaurant and event space. But those incoming flights, and tourists, and the associated development are causing inadvertent outbound flights of another sort. Concerns about loss of affordable housing and gentrification are real, and concern about increased traffic congestion is heightened, as are contentious conversations about building heights and density. “Hotels are getting the blame,” says Stephen Ramos, an associate principal and architect with LS3P who has worked on a number of hotel design projects, including The Spectator and Grand Bohemian. In reality, the congestion issue doesn’t appear to be caused by hotels, at least not by Ramos’s research (check out his “Buildings Are Cool” blog, buildingsarecool.com). In fact, hotels generate less traffic than office, retail, or residential uses. 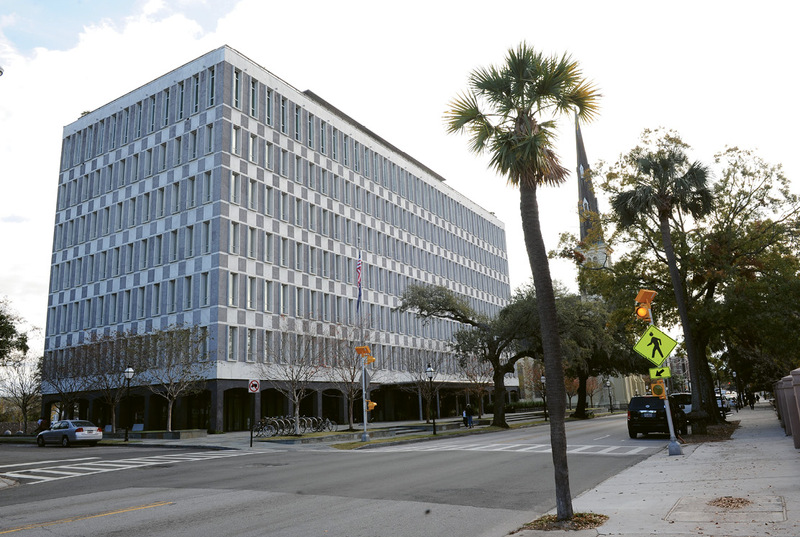 “When comparing buildings of the same size, an apartment building requires 2.2 times the amount of cars that a hotel needs, an office building 2.5 times, and a retail building 3.67 times,” notes Ramos, who used the City of Charleston’s ratios for how much parking is required per square foot as his formula. Furthermore, hotels are good stewards and desirable neighbors, Ramos and others argue. They’re staffed 24 hours a day and have a vested interest in creating a safe, well-maintained, attractive, and inviting atmosphere for their guests, which local residents can enjoy as well. And pay no mind to that argument that hotels are hard to convert to other uses should the economy take another downturn and tourism wither: “If The Dewberry could be created from an old office building, then surely the reverse is feasible,” asserts Ramos. To do that, Hill is pushing for a broader perspective. “In a perfect world, we’d look at hotels and accommodations across municipal lines, not just on the peninsula,” she says, noting that the real question is about what she calls “the product mix”—a range of hotels from boutique to limited-service to full-service with conference facilities. What’s currently missing, she adds, is sufficient meeting and conference space. “The meeting and convention visitor is critical to our long-term economic picture,” Hill says, pointing out that “no one ever moved a company here or built a new manufacturing facility in our region without first coming here as a visitor. Hastie is particularly concerned about the threat to affordable housing that he believes continued hotel development poses and is “baffled” by the fact that City Council members aren’t making the connection. “I don’t understand how we have council members who talk about affordable housing at every opportunity but aren’t supporting the mayor’s proposal,” he says. Displacement is one of Hastie’s primary concerns—i.e. an existing residential-use building that gets demolished for a hotel as, for example, the full-service hotel proposed and approved for the 400 block of Meeting Street would do. If it goes forward, that project would take nearly 159 units of existing below-market-rate housing out of the market, and though the developer has promised to replace that with an even match of residential housing, Hastie is skeptical. “We know that the type of housing they’d create would be much less affordable than what it’s displacing,” he says. And while the previous accommodations overlay ordinance did include language intended to guard against displacement, it “was a little passive and not super clear,” he adds. The ordinance had plenty of other faults, too, according to City Councilman Mike Seekings, who, as one of the more outspoken council members regarding the hotel issue, voted against it. Seekings lives downtown and represents citizens in the historic and heavily tourist-trafficked neighborhoods, and while he is not a proponent of unregulated hotel development, he believes the mayor was tackling the hotel question “from the wrong direction. A backdoor moratorium on hotels is a bad idea,” he says. As more hotels open or get added to the pipeline, visitors will have more options than ever for a good night’s sleep; meanwhile residents and city leaders may be losing sleep over the lingering questions or concerns: occupancy rates, parking, affordable housing, labor supply, business and resident balance, tourism overload, and then there’s the yet-to-be addressed elephant in the hotel room—Airbnb, now the world’s largest hotelier. Short-term rentals, or in Seekings’s words, “the sleeping monster,” are not currently allowed by the City of Charleston, although a quick Google search finds more than 300 area listings. While the city has called for a short-term rental task force to study and recommend regulation strategy, the group has not yet met at the time of this writing. 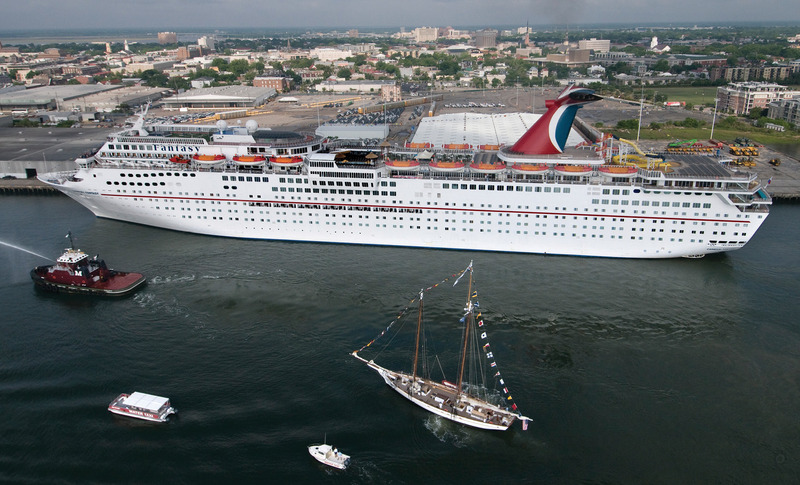 Additionally, Easton Porter Group CEO and Charleston homeowner Dean Andrews believes the hotel and cruise industry questions are interrelated in terms of how the underlying balance of tourism and quality of life issues might be best addressed. To achieve a beneficial balance, focus not on quantity for growth and instead proactively support investing in quality, he suggests. “I think the city would be best suited by establishing guidelines for the quality of the hotels,” says Andrews. More low-end, cookie-cutter hotels would result in an impact analogous to that of the Carnival Ecstasy and Sunshine ships. “These are 1980s versions with poor facilities, poor guest-satisfaction ratings, and high pollution, and their economic value is 95 percent to the Port Authority and very limited benefit to any Charleston stores, restaurants, or hotels,” he points out. “Clearly a top-quality cruise ship, or similarly, a high-quality hotel, has proven to bring greater economic benefit to the city. 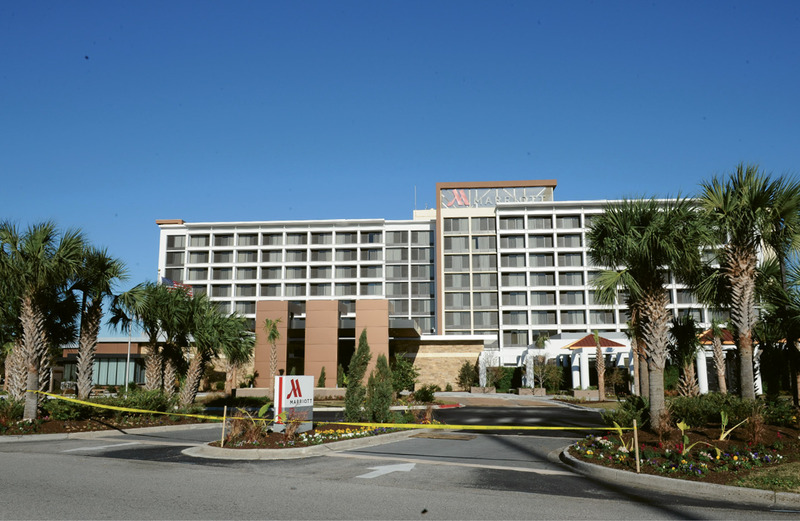 “Arguing for high-quality development isn’t a ‘class’ affectation,” Andrews asserts, but represents “a clear and quantified economic value to our community.” That’s why Andrews and his team pushed to open Charleston Place as a high-end luxury hotel back in the 1980s, while many were advocating building an economy brand motel instead. 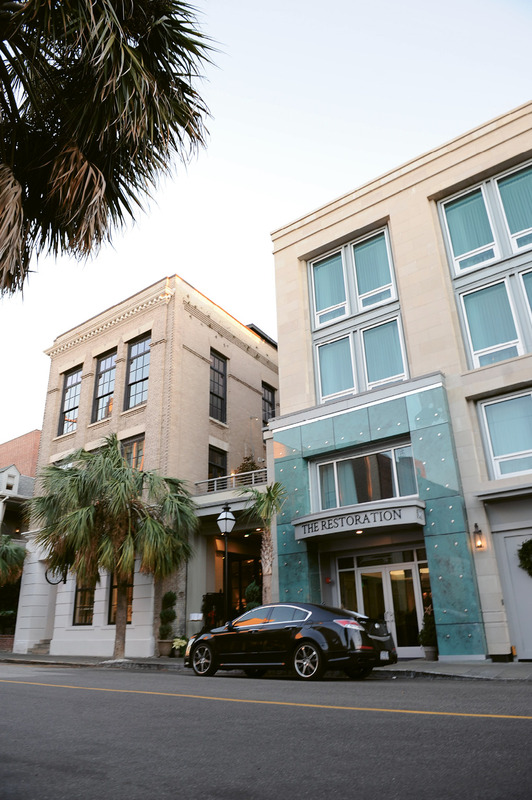 “We surveyed Charleston Place guests years ago to assess economic impact and found that based on 120,000 room nights, their non-hotel expenditures were close to $9.6 million,” Andrews recalls. Taxes that the city collected for those non-hotel retail and restaurant revenues was nearly $750,000, plus the hotels’ rooms taxes were an additional $5.3 million, with $120,000 going to the CVB on top of that. For tourism to stay strong, it must stay balanced, agrees Linn Lesesne, chairwoman of the CVB board and vice president of group sales and public relations for Charming Inns. “But it’s important for residents to recognize the benefits that result from the growth of tourism,” Lesesne says, noting that the industry has an almost $4 billion annual economic impact locally and employs 39,000 people in Charleston County alone. 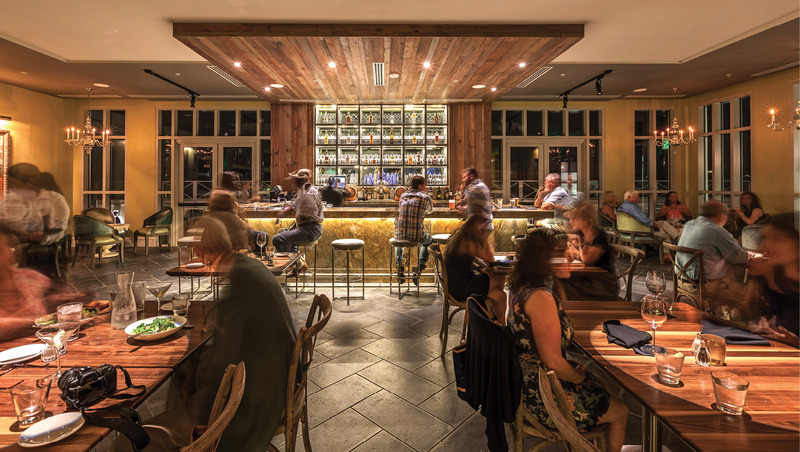 So much of what we love about Charleston—its world-class restaurants; its arts and culture and festivals; its shopping; and more recently, its improved airline service—exists because the tourism industry makes it possible. And if tourists can’t find a place to stay, they don’t come, spend money, and “contribute to our tax base that funds roads and bridges without burdening other infrastructure, like our schools,” Lesesne adds. Finding a place to stay will undoubtedly be easier once the doors to an additional 1,100 peninsula hotel rooms open by 2019. 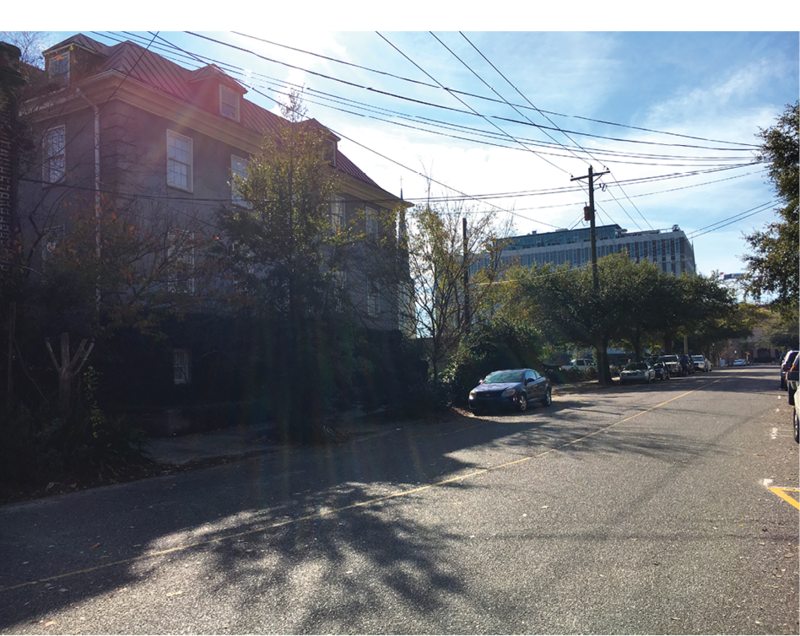 The question remains, though, whether Charleston’s hotel development sweet spot will become more apparent as city staff look again at the accommodations overlay zone ordinance, most likely removing targeted properties to keep them from becoming future hotels. What does seem clear, regardless, is that if Charleston is to remain an award-winning tourist destination as well as a booming and desirable residential city, solutions to the intertwined issues of infrastructure and transportation, affordability, and balanced community development need to find room in the inn, too.